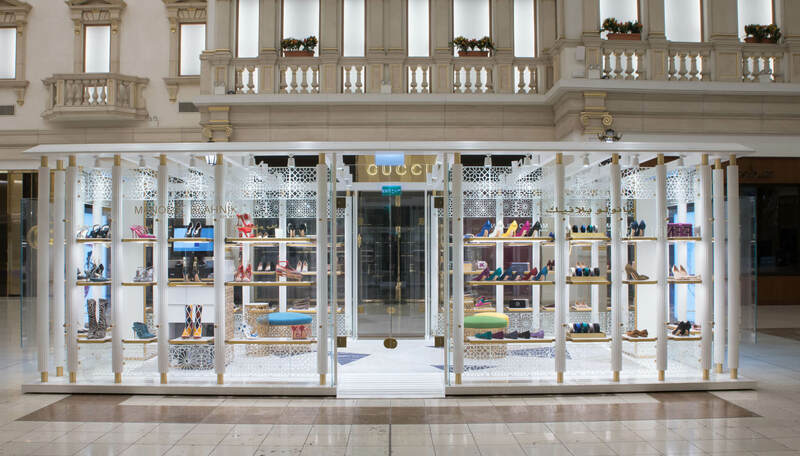 A new store collaboration with Nick Leith-Smith Architecture + Design and Spanish luxury designer Manolo Blahnik has opened in the Villaggio Mall in Doha, Qatar. This is the second Manolo Blahnik space to open in Qatar, after the boutique in The Gate Mall in Doha opened in February 2017, also designed with Nick Leith-Smith. Located in the Aspire Zone in the west end of Doha, the Villagio Mall receives approximately 50,000 shoppers daily, housing some of the world’s finest luxury brands in its Venetian-style interior. The store is a bespoke pavilion structure occupying 28 sq.m. The structure consists of 36 white fluted columns, from which glass panels are hung. The overall effect is that the interior of the store is visible from the entire outside periphery, creating an illusion of openness that is at once inviting and exclusive. The interior features a new, bespoke rug produced for the space by The Rug Company, inspired by Gio Ponti, in Caracas. The rug features geometrical patterns in shades of beige, cream, brown and black marble patterns. The space features five different patterns inspired by oriental architecture, which have been screen printed on the glass facade to create a strong interplay between light and shadow. The patterns have also been laser cut in brass metal for the bespoke ottomans, tables and cash desk. The white sivec marble floor and shelves creates a sense of brightness, complemented by the brushed brass on the furnishings and the colourful seats found inside, in reds, greens, blues and yellows. The white materials and clear lines of the interior harmoniously oppose the screen painted patterns of the facade.